The Baby Whisperer does not approve of what she terms “Accidental Parenting.” I do not approve of the Baby Whisperer. I think there is a kind of beauty in the accidents of parenting. I became a parent on purpose, but it could just as easily have been a happy accident. I certainly make use of whatever works in parenting Owen. To get him to sleep, I’ve gone through phases of nursing him, of walking him up and down, of lulling him in the swing, of giving him a bottle, of reading him a story or three, of letting him cry, of going back to lay him down, or of picking him again up to calm him down. And I change what I am doing when it’s no longer working. 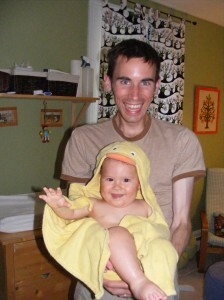 (I am sad to report that the bedtime story routine that I was so proud of – Owen likes stories! Stories put him to sleep! – has failed for the past 3 days. He’s become squirmy, possibly because he’s figured out that storytime means bedtime. I am fighting this particular accident). I think it’s natural to do what works – BECAUSE IT WORKS! – and just as natural to phase something out when it’s no longer right. I had a horrific beginning to breastfeeding. I’m sure it was not as bad as some people’s, but it was bad enough that I winced in pain at the thought of Owen’s approaching mouth and once worried that I would squeeze his head too hard. I was that tense. But after the first 2 weeks, it got better (it only hurt a little! ), and after the first couple of months, it was not painful at all, and after more months, it had become pleasant and convenient. My plan was to nurse Owen until he was one. I pumped once a day until he was nine months old so he could have breastmilk at daycare. At some point, though, this arrangement wasn’t working for me anymore. So I stopped. Then Owen got 2 ear infections and the second doctor we took him to suggested that it might be because I wasn’t breastfeeding. I had just stopped pumping the week before and was nursing him in the morning and at night. I was, after all, working full-time. I thought I was doing pretty well. But inevitably, guilt kicked in, and I eliminated formula on weekends, trying to make up for daycare. I lasted about 3 days. I couldn’t do it anymore. We were past that point, ear infections notwithstanding. One day last week, at eleven months old, Owen refused the breast for the very first time. He pushed it away, grinning. He bit me. Twice. I put him to bed and I cried a little. I hadn’t decided whether or not that meant the end. The next day, he seemed to want it. So I fed him. And two more days after that. But my heart wasn’t in it anymore. So we stopped, and it felt right. It was accidental, but mutual, like so much of our developing relationship. If it’s good for him, and good for me (and good for Duncan), then we proceed. If it’s not working, we try something else, until another accident becomes the solution. Individually and as a family, we’re trying things on to see if they fit. Sometimes they’re too big, sometimes they’re too small, but sometimes, they’re just right. At least until you outgrow them. My mother-in-law was here last weekend, and she is a wonderful guest: generous (she arrived with a suitcase of presents); helpful (she made dinner, including one of the best rhubarb crisps I have ever had); and respectful (she almost never offers unsolicited advice). I know! She’s like a dream-mother-in-law… And yet? in the brief 4 days of her visit, I realized how much I craved my alone time. And I don’t even mean time alone with Duncan – I mean A-L-O-N-E all-by-myself time. And I had heartburn (maxing out on the recommended daily dose of antacids for pregnant women). And my hips ached. And my pelvis felt like it was cracking/had cracked. I had a really easy pregnancy – these above represent the sum total of my complaints, and they really only kicked in in month 7. But while I was creaking and groaning and Owen was scratching my insides (“where nae men should be!”)* – scritch, scratch – people who had had babies were telling me that I’d miss being pregnant. That I should enjoy my peace and quiet while it lasted. But I kind of disagree. I wasn’t the most gracious host. I resented the bloat and the discomfort. An hour or two after Owen’s birth, yes, I was marvelling that we had a son, I was also so extraordinarily joyous NOT to be pregnant anymore. “I’m not pregnant!” I said, jubilantly, as soon as Duncan and I were alone with Owen. I seriously think the “now we have a baby” part might have been second on my mind. People talk about getting your body back after pregnancy – and they mean losing the baby weight – but seriously? What was WAY MORE IMPORTANT was having myself to myself. And even though the first several weeks were sleep-deprived, my hips stopped aching, my heartburn went away, and my pelvis knit itself back together. And I could take naps BY MYSELF. I’d like to do the pregnancy thing one more time, and I’ll consider myself lucky if I get there again. But I so vastly prefer having a child on the outside than on the inside. *A quote from Elizabeth Gaskell’s novel Cranford, referring to a band of housebreaking men. It’s a great book, about spinsters! Warning: This may turn into a rant. There is a whole lot of desperation in the early days of motherhood, when owning a book with “secrets” and “baby” in the title sounds like exactly what you need. But Tracy Hogg’s Secrets of the Baby Whisperer is an evil book because it tells you to trust your instincts, as long as your instincts follow a predictable pattern that she has set out for you: the (in)famous E.A.S.Y. (Eat, Activity, Sleep, You). Because there should be time for massages and pedicures in the life of every mother of every newborn. There are some lovely ideas in The Baby Whisperer. I loved Hogg’s insistence on communicating with your baby from the first moment, giving your baby a tour of the house, explaining what you are doing when you’re changing a diaper or putting the baby down for a nap. I think she’s right that as awkward as it seems to talk to a newborn, you never know what the baby will understand and when. Also, your baby won’t really be talking back for at least a year, so you might as well get used to chatting with your alternately silent, cooing, and whining child. I won’t even get into the fact that the book’s co-writer decided on a conversational style in which the Yorkshire-born Hogg addresses the reader as “ducky.” How alternately tacky and condescending. But I said I wouldn’t get into that. My real issue with Hogg is that she makes you feel guilty for feeding your baby. And while I was feeding Owen, with my one free hand (the other was supporting the “latch”), I would hold The Baby Whisperer and read about the secrets of raising an E.A.S.Y. baby. And I realized that what I was doing was all wrong. Feeding your baby to sleep will teach him bad habits and prevent him from being able to fall asleep on his own! Only one kind of cry meant that he was hungry, and good, attentive parents learned to interpret their babies’ cries! If I didn’t learn to interpret Owen’s cries quickly, he would stop differentiating between his staccato cries with hiccups and his long wailing cries and soon there would be no pattern to follow and I would be lost! After several weeks of this, I actually threw the book across the room, walked downstairs, and said to my wide-eyed husband “The baby whisperer is full of s***.” I eventually talked myself into putting the book away and following my instincts (without the pattern). And yet … though I haven’t opened it in months … it still beckons. 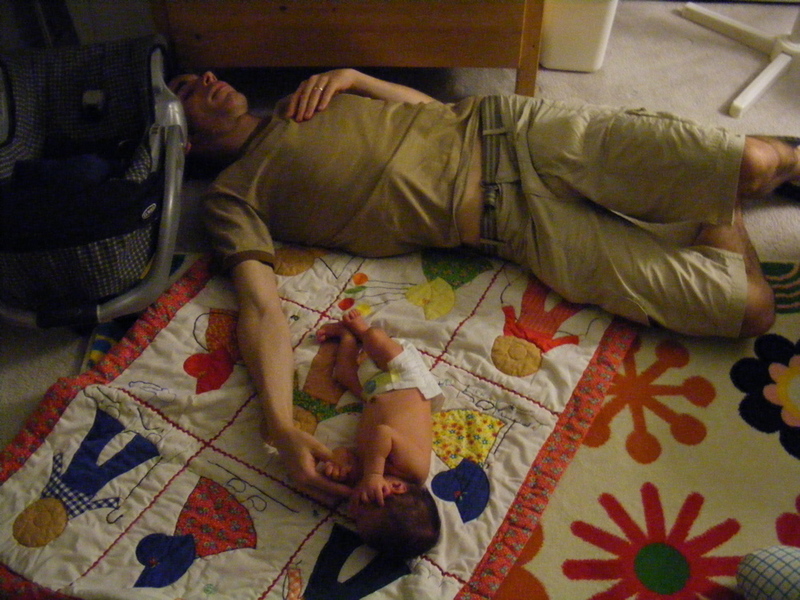 I do believe that in time, you will develop a routine with your baby. I do believe that by the time your baby is 6 months old (maybe), you can tell if he’s crying because he’s tired or because he’s hungry. But when he’s 2 weeks? 2 months? Crying is crying. Even when your baby isn’t crying you hear echoes of the last cries. Out for a walk without the baby I heard him crying. Alone in the house I heard him crying. I still do and he’s over ten months old. It took me months to get over the guilt that Tracy Hogg instilled in me. And I don’t think any new mother needs any more guilt than she is already feeling. P.S. I am sure the baby whisperer has worked for some people. I am not one of those people. A couple of days ago, I was using google as a calculator. You can do anything on google. I typed in 26 and the search engine supplied “26 weeks pregnant.” Immediately, I had a flashback to myself, a little over a year ago, as I looked up the stage of my pregnancy week by week … by week. I really did google every week of my pregnancy, and I often skipped ahead, marvelling at the inner and outer diagrams of my and my baby’s growing bodies. I was curious about the mystery growing inside of me – an actual person who would emerge and develop his own perspective on the world – but I was also nervous about my own transformation into a mother. I read books (lots of books) to try to prepare myself for this momentous change. What I noticed right away was how very certain about their own messages (yet how contradictory!) these books were. Everyone agrees what a fetus looks like at 26 weeks gestation, but no one agrees on how to get a baby to sleep through the night. This certainty, while it might sell books, can be really demoralising for a newly-minted, bleary-eyed mother. So I sought out some specific narratives of pregnancy and parenting from friends and from a couple of blogs. I have found their variety of experience infinitely more reassuring than any published prescriptions for happy babies. My son Owen is now (already!) 10 1/2 months old, and I have been feeling more and more like I have things to say about my experience of parenting (and about babies, who I actually gush over now). Not that I claim to know what I’m doing, because I still have all kinds of doubts and am really just muddling through, but because I want to share my ideas and hopefully, eventually, get feedback. Parenting can be a very lonely state full of self doubt, especially in our current social environments, where an ideal model often seems to involve a mother alone in the house with a baby. I think that the internet can actually function as a kind of community where we can share our ideas and feel a little less isolated. So I’m adding my thoughts to the fray, and if you’d like to read along, welcome.